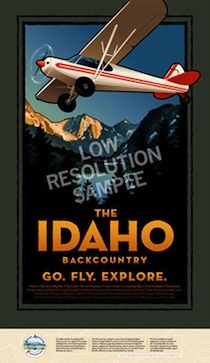 Please consider a donation to the Idaho Aviation Foundation. IAF is a 501(c)(3) non-profit organization, meaning your contribution is tax-deductible to the fullest extent of the law. Send a check via USPS to IAF, PO Box 2016, Eagle, ID 83616. Request further information and an IAF director or other volunteer will contact you. 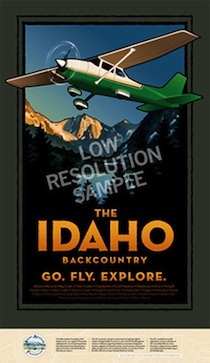 For assistance, call Idaho Aviation Foundation at 208-861-9056. Your contributions to the IAF will help further our goals to accumulate, preserve, maintain, repair and enhance our public use airports and provide education to enhance safety. 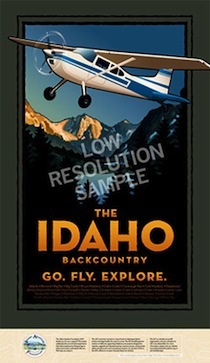 Our fundraising campaign features a special edition backcountry flying poster for donors contributing $100 or more. Smaller donations are also welcome. This beautiful art is suitable for framing or gift-giving. Your donation is tax deductible (follow IRS guidelines for donation and gifts). Are you ready to contribute AND get a gift in return? It's simple to donate. Click here to donate online or send a check for your intended donation, along with a note that indicates which poster(s) you would like. Make check payable to Idaho Aviation Foundation.